I've converted my whole site to wordpress, so the blog has a new RSS feed. The second is actually old, but I forgot to publish it for some reason. My grandfather died almost a year ago. It’s been a hard one, good and bad, but I’ve been busy and it’s gone by quickly. 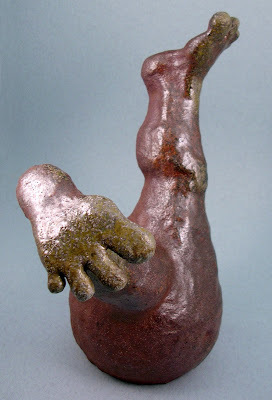 It’s been a year since I started this post -- I promised to post some thoughts regarding my grandfather and other connected things, pottery-related and not, that I’ve been thinking about for a really long time. My Grandpa Fred worked for an aerospace company. He could build anything in his garage (and he did). He taught me how to weld and how to use a metal-lathe. He built a stern-wheeler out of blocks of balsa wood and metal. If he needed a certain tool to do a job, but didn't have quite the right thing, he would build it himself. I wish I had been older when he was younger, or that I had been more interested in hanging out with him in the garage. But I'm grateful for the things my grandfather gave me -- good spacial-visualization, confidence in my ability to make things with my hands, the ability to figure out how to do things without being shown. Of course with those things came stubbornness and the belief that I'm probably right even if I have no idea what I'm talking about. My grandfather made and fixed things, constantly. He got satisfaction from solving problems and working with his hands. I get that same satisfaction, but my life is dramatically different from his -- I have fewer opportunities to make and fix. Pottery fills some of that need, but not all. For the past year or so I’ve been aching to spend more time building, cooking, sewing and growing and less time typing and clicking. Problem is, between the day job and the studio, there just isn't enough time in the day. Brandon Phillips quoted Matthew Crawford about this time last year, and I’m glad he did because Crawford’s book, Shopclass as Soulcraft, played right into some ideas I’d been turning over in my head for years. Crawford quit a cubical job to be a motorcycle mechanic because he decided he'd rather spend his days actually doing something, rather than typing and clicking. "The satisfactions of manifesting oneself concretely in the world through manual competence have been known to make a man quiet and easy. They seem to relieve him of the felt need to offer chattering interpretations of himself to vindicate his worth. He can simply point: the building stands, the car now runs, the lights are on." Industrialization has changed our relationship with the daily grind. Back in the day, people spent their days working to directly produce the things that we now buy at the store. So for most of us, our work days consist of re-arranging bytes with the end goal of making money for a big company, or moving along the bureaucratic process of the government, or something otherwise unrelated to our actual lives. We spend all day in front of a computer, collect our paychecks, go to the gym, buy stuff from the store, live in condos, eat at restaurants. I'm not judging--I do these things myself. I’m not a full-time potter growing my own food. While that sounds lovely, I have no other means of financial support, and I choose the stability of a day-job over an idyllic pastoral existence. We do all these things because that's how we achieve some sort of middle-class American life, and for the most part it's fine. 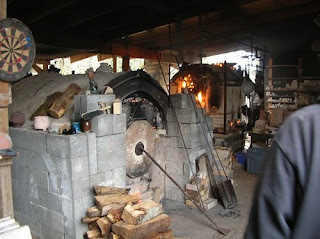 Little Woody is a small, downdraft wood kiln. It held about...40 cubic feet (?) of work, and regularly fires easily in 12 hours. We took a few extra hours because we had the time and the wood, and didn’t really know what we were doing. So...the firing actually went pretty well, but I didn’t realize it at the time. We got cone 11 down and 12 soft all around. Our cone packs were almost identical front to back, and pretty close top to bottom. We candled with gas overnight (felt a bit like cheating, but that’s how they do it there), and started with wood at 5:30 am. Once we started stoking, we let the kiln take off and gained 300-400 degrees F per hour until we got cone 010 down, did some body reduction, and kept cranking. We had planned to stop firing at about 6:30. We were supposed to be off campus by 7pm, and had left ourselves plenty of time. But around 5pm, the kiln stalled out. We were stuck at 2200 and unable to get any hotter. We opened this and closed that, increased the size of our stokes, decreased the size... tried everything we could to get the temperature to raise. Cone 10 was down and 11 was slightly soft, so we knew we had gotten up to temperature for a while at least. My main concern was whether we could end at a hot enough temperature to avoid crusty unmelted ash on the pots. Cone 11 had been slightly soft for hours, and the fact that it wasn’t moving any farther made me think we’d cooled off too much. I was determined not to stop firing until I got it to move even a hair more. Two days later we opened the kiln. I had nightmares the night before about crusty, ashy pots and unusable bowls. Much to my surprise, the pots were perfectly smooth. That stubborn top cone 11 had melted into a perfect arch and 12 even softened slightly. The ash was amazing--some lovely green drips. 2) Don’t rely on pyrometers. We knew this--everyone says to use them to get an idea of whether your temperature is rising or falling, but not as an absolute number. Everyone says it, but no one does it. Yes, I’m a terrible blogger. Haven’t posed anything in a year. I’ve actually had some posts in mind, and even half-written, just haven’t managed to get them finished and posted. But first, let me catch you up on the past year. Since last I wrote, I’ve failed to finish the quilt but succeeded in becoming somewhat happy with my electric kiln. I found a dark brown clay that looks great in oxidation, and made a couple of sculptural, wall-hung pieces that I’m very happy with. Still experimenting with the transfers--I’ve got the process down (glaze, apply transfer, fire to cone 04. 06 is not hot enough. 02 is really ideal, but then I can’t throw them in with a load of bisque, and it takes me long enough to fill a kiln that I really need to be able to multi-task). This fall and winter were tough for a variety of reasons. My grandfather died in October. He seemed to be ready (as ready as anyone can ever be, I suppose) and it happened quickly enough that he didn't seem to suffer much but with time for everyone to say goodbye. So it wasn’t a bad thing. I've been thinking about his life and our relationship. I’ll post about that soon, as it relates to some other things I’ve had on my mind lately. Anyway, his death and the accompanying travel (which occurred during and after Portland Open Studios) made October a rough month. November brought other trials that I won't go into, but the end result was to throw me off my game a bit this winter. I didn’t want to be in the studio, so filled my weekends with hiking, skiing, and spending time with friends and family. Which was really a very good thing in some ways, but not very productive. But it’s spring now! You wouldn’t know it from the weather (cold and rainy, just like winter), but the trees and flowers are blooming and we have the occasional warm day. 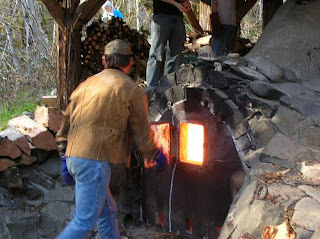 In February I fired with Ken Pincus, who has a lovely down-draft kiln 10 minutes from my home. He has a great firing crew, and runs his kiln in a way that I really appreciate. He has a specific idea of how he wants to fire, and gives clear yet polite instruction to the crew. The one drawback is that it’s smaller than an anagama, so there’s not much room for larger sculptural pieces. 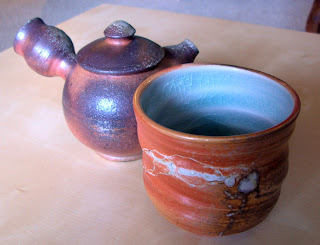 Looks like I’ll be able to fire some new work there later this month--teapots, cups, bowls. Carol Opie and I are also trying to rent the Little Woody at MHCC. It’s an even smaller downdraft kiln, but with just the two of us firing we'll have plenty of room for work. We’ve been trying to rent it for a year now (! ), but it needed to be rebuilt over the winter. The rebuild is now complete, and it seems to be firing really well. We have wood and pots ready to go, and finally set a date--early May! That’s all for now. Stay tuned for more... hopefully before next Spring! Winter is for finishing projects. Finally I'm getting around to finishing up a few things. I had planned to get so much done over the holidays, but something came up at work so I didn't have as much time off as I'd expected. But the dark and rainy nights of January are pretty good for getting me to stay in and be crafty, so the past couple weeks have been productive. This is the quilt I started last winter during Snowpocalypse 2008. One side is jackets and pants, the other is dress shirts, all from Goodwill and Salvation Army. The squares are finally all put together. Next step is to find some cool fabric to use for trim on the wool side (I'm thinking burgundy corduroy or velour), binding (charcoal gray?) and batting for in between, then sew them all together. I saved the buttons when I dissected the clothes and I think I'll use them to "quilt" it all together (like the toothpicks that keep everything from shifting around after the top, batting and bottom are sewn together like a sandwich). The other project I've been sitting on is this laser printer transfer stuff. The idea is that laser printers use iron in the toner, so you print on these transfers, float them onto glazed pottery and bisque fire to set the iron onto the work. The transfer process went more easily than I expected, and they look great now. We'll see how well they survive the bisque. Hopefully I won't discover that my printer is one of the few that doesn't use iron. These are just tests--stay tuned for some actual pieces if everything works according to plan. Images are from David Attenborough's Amazing Rare Things. I had planned to spend the winter making lots of cone 6 work, to put my electric kiln to good use. When I was in Tacoma over the holidays I went to the Clay Art Center (awesome!) and bought a bunch of clay and glaze. Since I found out that I'm going to be firing with Hiroshi in April, the cone 6 project has become somewhat lower priority (20 cubic feet is a lot of work! 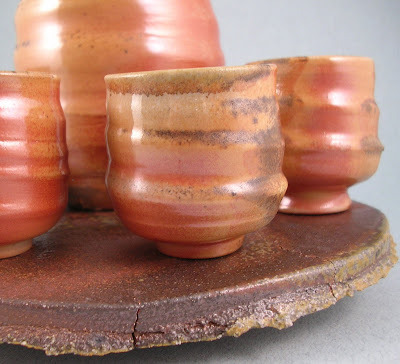 ), but I've thrown test cups of the three clays (Grolleg, Oregon Red and Oregon Brown) and will bisque them probably next weekend. I'm also experimenting with more pendants (want to see how melted glass works in the electric kiln--hopefully not too boring) and some towel tags (like wine-glass charms, but for your towel). A little kitschy, but fun to make, and I need some. I want to test the clay and glazes before I make a lot of work, but I also want to fill the kiln before I fire it to cone 6...so I might have to take a chance with some mugs or something and just hope for the best. I'd offer to fill in with other people's work, but since I haven't fired the kiln to cone 6 yet, and it's not the fanciest kiln ever, I'd hate to risk your stuff. As for the work I'm making for Hiroshi's -- he recommended a clay called "Big White" for his kiln, so I bought some at the Clay Art Center. It's really gritty but it throws pretty easily, and the name inspired me to throw some big pieces. Big for me--8 lb vases mostly, but a couple of two part pieces that are a little bigger. One tall vase that had me measuring my kiln. Some are really tight, others are much more loose, with great swirly throwing marks. I like them all! Also some more bottle and cup sets--need to make some trays to go with those. And I'll probably make a few more footed vases and maybe another flailing feet piece or two. I spent this Sunday morning working on photos for my portfolio and drinking tea out of this teapot and cup, both fired at Digger Mountain. I love how they both turned out -- I wouldn't change a thing about either. Drinking tea out of the cup is a pleasure to the eye, hand and lip. The blushing on the teapot sends shivers down my spine, and the pour is nice and strong without being splashy. Reminds me of a moment, in middle school band camp (one time, at band camp...), we were practicing Pachelbel's Cannon -- playing the part where the 2nd clarinet has the melody line. I got this intense rush of wonder at being part of something so beautiful. I think that moment is why I stuck with music as long as I did, in spite of my lack of skill. It is a very wonderful thing to be in awe of the beauty of something you've made with your own hands. So my holiday wish for you is that you create something this year that gives you shivers and makes you proud to be you.